When I was fifteen I got my heart broken for the first time. I was already an overly-emotional and fragile teenager (really, who isn’t at fifteen?) but this heartbreak had me positively melancholy. 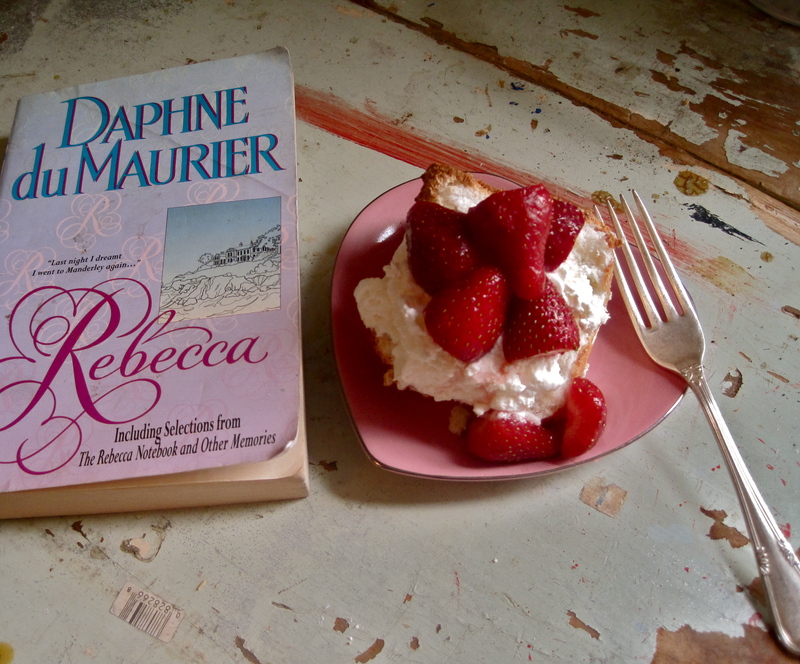 After weeks of sulking around the house, skipping school and crying at any good-natured joke my dad aimed my way, I arrived home one day to find a copy of Daphne Du Maurier’s Rebecca sitting on my pillow. My mom had placed it there hoping it would distract me from my total devastation, and distract me it certainly did. From the minute I picked up that lavender and pink paperback with loopy cursive scrawled across it and read “Last night I dreamt I went to Manderley again” I was hooked. I spent hours in my room reading, so wrapped up I forgot for the first time in my life to eat. When I emerged from my room days later I was so gaunt and spindly that my grandmother gasped when she saw me. 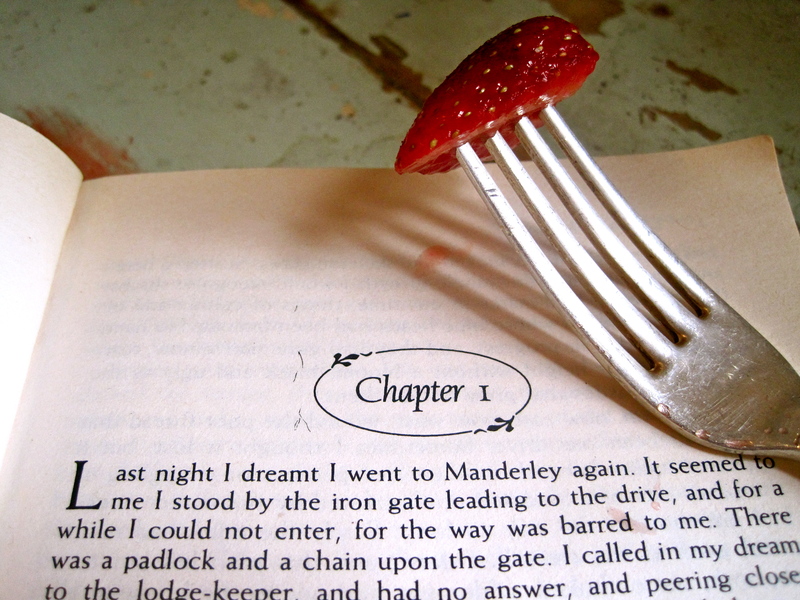 There is something sustaining and even filling about du Maurier’s writing, and it isn’t just because her novels are filled with food. There is a richness about her language that is decadent and thick and sinfully good. The descriptions of food in Rebecca are both mouth watering and visceral, as the narrator moves from a “dry, unappetizing plate of ham and tongue that somebody had sent back to the cold buffet half-an-hour before as badly carved,” to thick slices of bread with butter, “cucumber and watercress sandwiches”, and “bowls of fresh raspberries and peaches.” The tea scenes at Manderly are the most elaborate and tempting, with “dripping crumpets…Tiny crisp wedges of toast, and piping hot, flaky scones. Sandwiches of unknown nature, mysteriously flavoured and quite delectable, and that very special gingerbread. 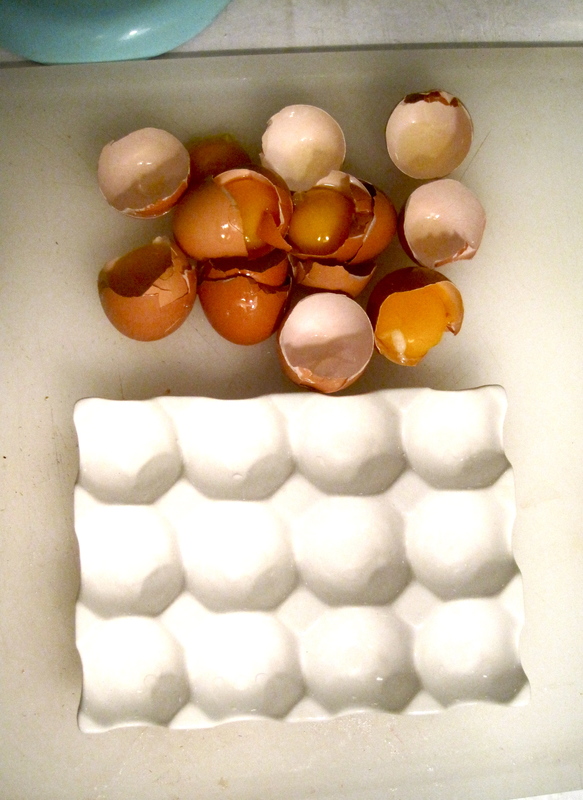 Angel cake, that melted in the mouth, and his rather stodgier companion bursting with peel and raisins” (pg. 8). Last week, with Valentine’s Day approaching, I started scouring my bookshelves for the best romantic literature and stumbled across my copy of Rebecca. As I was re-reading I noticed that angel cake is mentioned at least three times in different tea scenes throughout the novel. 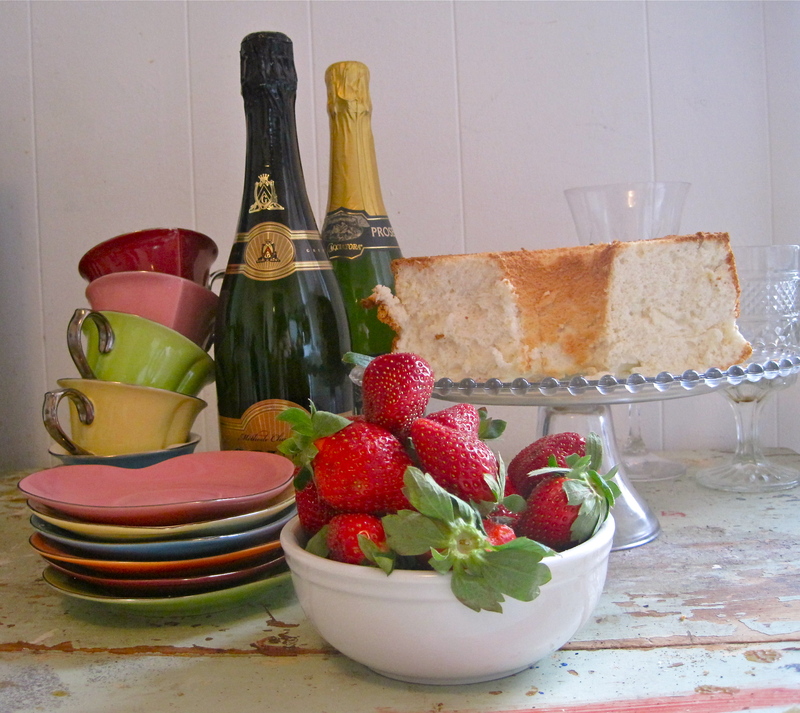 Angel food cake is a perfect Valentine’s Day dessert. It is quick, simple and impressive, not to mention easy enough on the waistline that you’ll still fit into that little something later on. 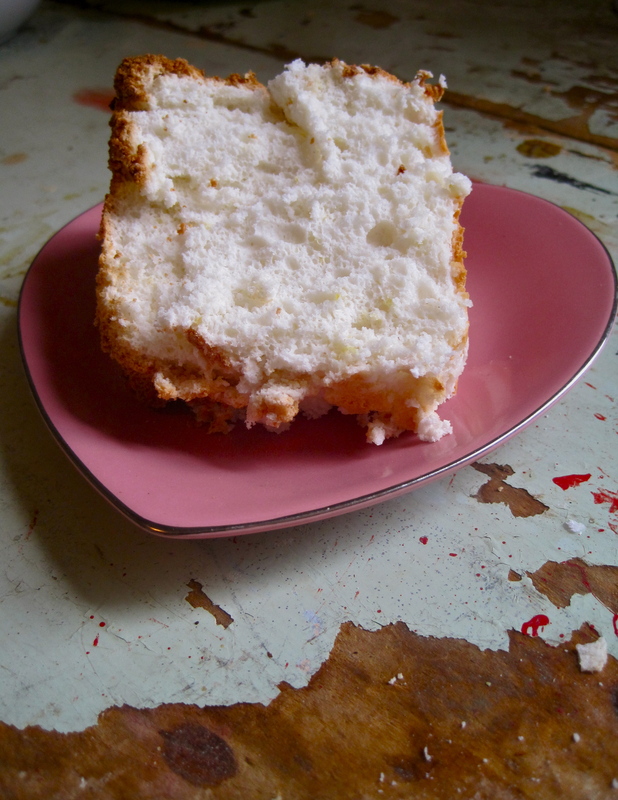 I used cake flour and superfine sugar to make this cake really melt-in-your-mouth light. Cake flour is easy to find, but if you can’t find superfine sugar just put regular granulated sugar into a food processor and pulse until it’s the texture of fine sand. It’s worth the effort I promise! Pre-heat oven to 350 degrees. Slice strawberries and place in a bowl, toss in sugar and set aside in the fridge. Sift flour and 1/2 cup of sugar together and set aside (if you have the patience to sift this mixture 3 or 4 times do it, it makes a difference). 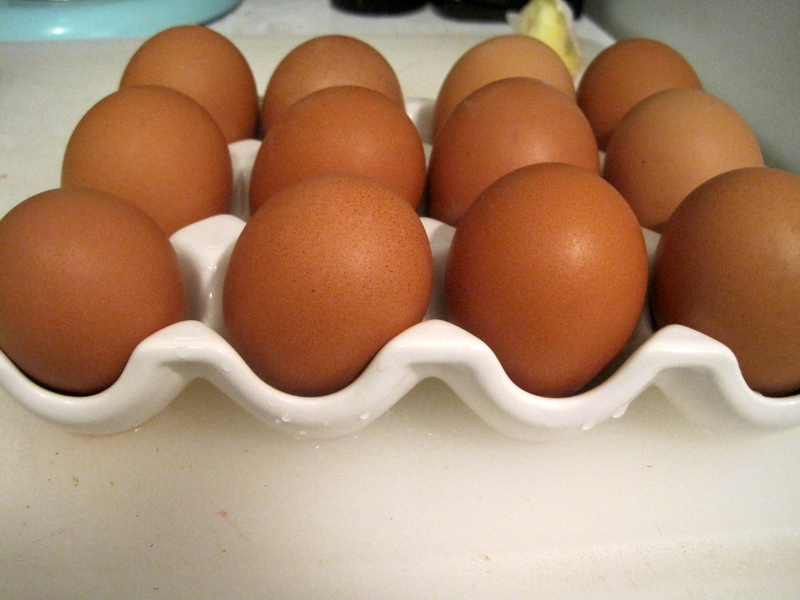 Separate eggs and add 1 1/2 cups of whites to the bowl of a mixture fitted with the whip attachment. Add cream of tartar and salt and whip on high speed until thick (1-2 minutes). While whites are whipping zest your lemons. 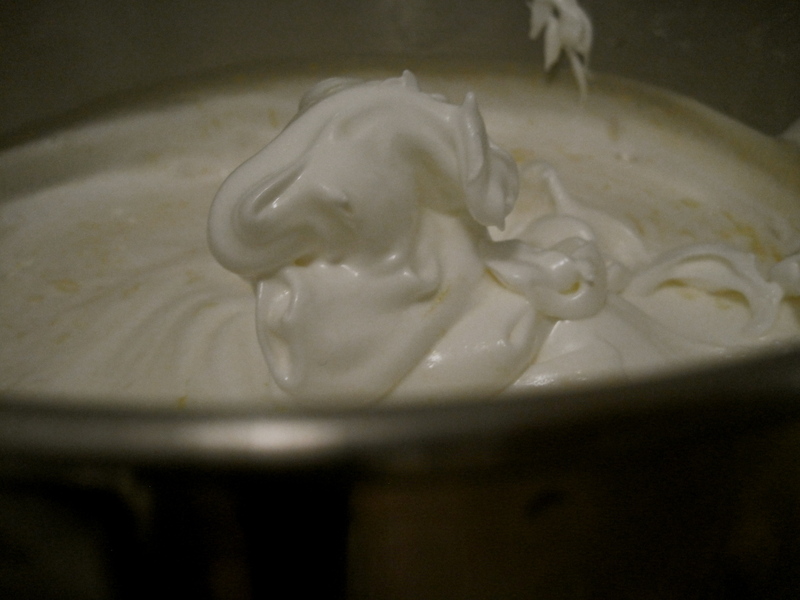 Once the whites are foamy and thick add the lemon zest, vanilla, and remaining 1 1/2 cups of sugar and continue to whip on high until you have stiff, glossy peaks. Fold flour sugar mixture into whites gently until fully incorporated. Scoop batter into un-greased 10-inch angel food cake pan (do not grease the pan, it will keep the batter from rising) and bake at 350 for 40-50 minutes. Remove cake from the oven and allow to cool with pan turned upside-down–this keeps the cake from sinking while it cools. 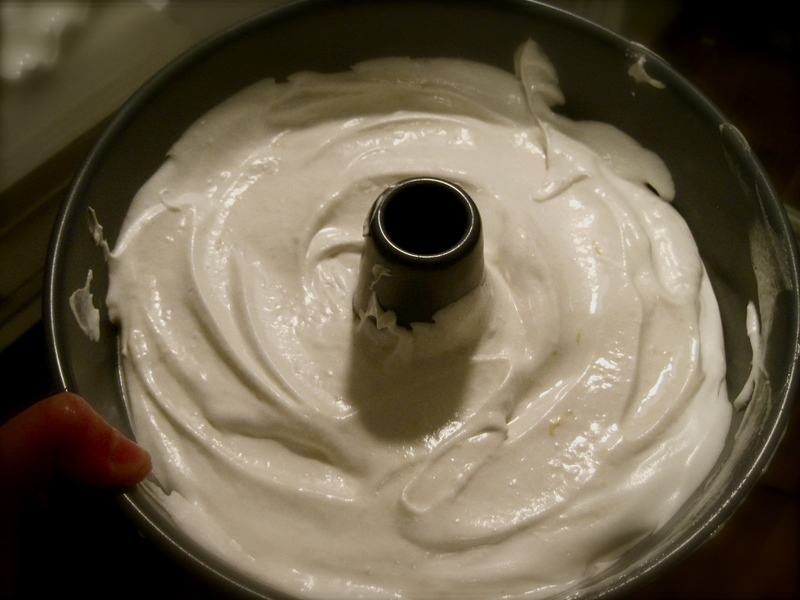 Once cake is almost cool, whip your heavy cream, adding sugar and/or vanilla extract to taste. Slice cooled cake and top with freshly whipped cream and strawberries.